I have a bunch of new games to play, but when I sit down at the computer what I feel like doing often turns out to be beating up more thugs in Arkham City. I thought I’d explain how it works and try to explain why it’s so compelling. You can get through the game itself on Normal with little more than mashing Attack… though you’ll need to know the special moves to take down thugs with armor, stun sticks, or shields. For Hard, however, you’ll have to learn to fight the way the game wants you to. That means timing + combos. The first level-ups I get are not extra suit armor, but the combo enhancers. One allows you to get combos at x5 rather than x8, and the other increments the counter by 2 rather than 1. With both enhancements, you get combo moves every four punches. There’s also a useful upgrade which makes your character faster once you’ve got a combo going. So the basic mechanism is punch, punch, punch, punch, combo. Missing a punch will interrupt the combo, which means a) you can’t button-mash, and b) you’ll be swinging the mouse to face an enemy between punches. Fortunately the game is quite forgiving about aim: you just have to roughly face someone. Once you’ve got going, it doesn’t matter how far away they are; indeed, if you choose someone across the room you can get some time to think. You also can’t wait too long between punches (more than a second or so), though really, there’s a thug right there, what are you waiting for? Getting hit also interrupts the combo, so you have to stay awake and learn to use block (mouse 2). Fortunately this counts as a punch for the combos. Watch for the white wavy lines, but don’t wait too long. AC doesn’t seem to require you to aim your blocks– you don’t have to face the attacker. If thugs are attacking, a panicked mash of mouse 2 doesn’t break the combo– but blocking when no one’s attacking will break the combo. E, to entirely eliminate a dude. This is great for getting rid of guys with armor. For Batman it’s also the best way to get rid of guys with stun sticks. R, to push people back and give yourself some space. 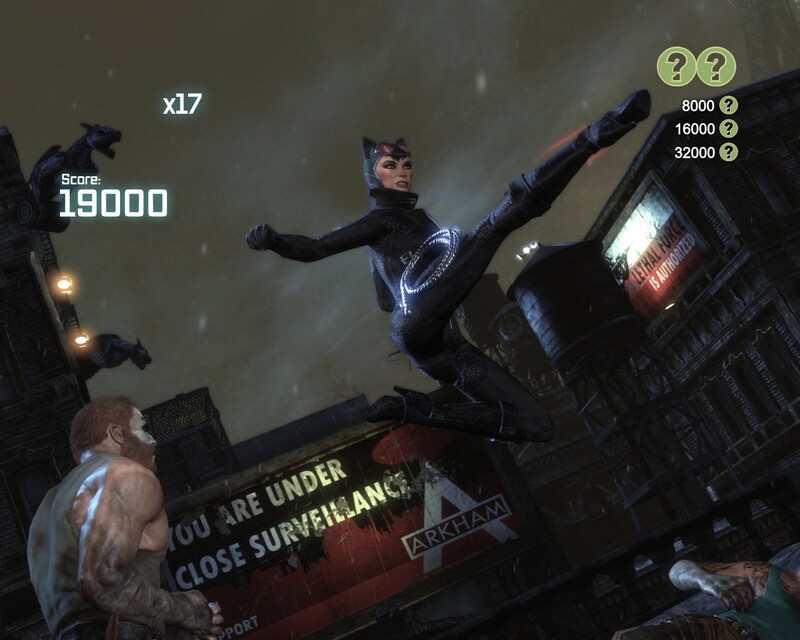 T, which for Batman finishes off everyone who’s on the ground, and for Catwoman knocks down everyone in range of her whip– and makes enemies drop shields and stun sticks. After using the combo, hit or block four more dudes and you get another combo. Use your first combos to get rid of armored guys, then use R (Batman) or T (Catwoman) to mow down the rest. It’s possible to clear the entire field with one sustained combo, which gives you the Flawless Freeflow Bonus in the combat maps. You can also use your gadgets within the fight by hitting the appropriate number key twice, without breaking your combo. I can’t say I’ve mastered this, but for Batman the gel (3-3 to set, 3-3 to explode) can be effective; and for Catwoman the caltrops (2-2) make people stumble, so they’re great to throw into a mob. Though I like taking out shield guys with the combo keys, the aerial takedown (mousewheel space space) is worth mastering, as these dudes will annoy you with unblockable attacks. You can use evade once within a combo if you jump over a thug; this is especially useful with stun stick guys as you can then hit them from behind. In boss fights I hit the hell out of evade (giving up on combos) since most of them have extra attacks. I hate the guys with knives… there is a counter, but it’s so slow and non-intuitive (hit block three times, in between slashes) that I don’t bother. Jump over them, or just make sure you attack them before they start moving toward you. The hammer and sickle guys (who reappear on some of the extra combat maps) are powerful but very slow, with an obvious buildup. What I like to do is hit them fast four times, then use the combo key on someone else. Use block if other thugs are bugging you, and jump over the big dude if he’s about to swing. This technique will not only give you a bunch of combos but fairly quickly take down the lieutenant. You can use the same strategy with Titans, but liberally use stun (mousewheel) to addle their minimal brains. Batman can ride the Titans, which is a blast; Catwoman apparently can’t. So that’s how it goes. Why is it fun? It’s hard to say, but part of it is the pleasure of mastering a somewhat difficult set of skills. Games where you carefully aim reward hand-eye coordination and patience; games where you frantically mash the attack button mostly just tickle our sense of tension. AC’s combat is just difficult enough that it’s challenging, and therefore rewarding when it works. In that way it’s similar to the parkour of Mirror’s Edge: it requires a certain skill to move Faith quickly and smoothly across the map. At the same time it’s not too complex. DC Universe Online has a whole set of extra skills, each of which requires fussy keystrokes like mouse 1 tap tap tap hold tap. I can fit only a certain number of techniques into my brain. The game tracks how many moves you’ve made without interruption, and in the combat maps your score, so you also get the primal gamer fun of running up numbers. 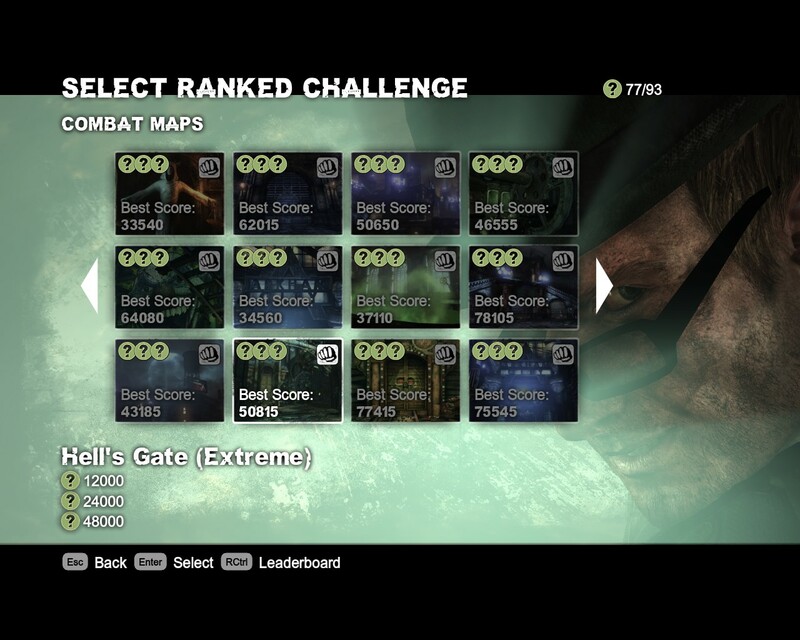 It’s satisfying to break a hundred moves or to achieve a new personal best on a challenge map. The animations and sound effects add to the fun. The E finishing moves look brutal, and the echoing crunches make you feel like a badass. It may be helpful to look at predator mode too, and see why it’s so much more fun than stealth mode is in other games. Stalking a bunch of armed thugs in a room is a blast largely because you have so many options: sneak up behind them, drop from above, pop up out of grates, grab them from under a ledge. Batman can set traps using his gel or the sonic batarang; Catwoman can crawl on the ceiling right above unsuspecting thugs. You still have to be careful– the dudes have guns and in Hard mode, they can kill you quickly. But in general you feel like you have a lot of interesting options; it’s nothing like just holding down Ctrl and waiting. In many games it’s the number of weapons that adds strategic depth: do I use my crowbar, my Magnum, my Combine rifle, my shotgun, or what? In AC you also have choices (combos, blocks, evasion, gadgets), so it’s not just hitting the attack key.